Guys – this post is not for you. I know there are plenty of frustrated men who wake up with curls in their noses and mouths, but I’ll have to write a post for you another time. Today’s post is for the ladies (and a few guys!) with curly hair, who want to extend the life of their long curls past wash day. Curls are fragile creatures and often don’t survive the night without protection. Curls get crushed, tousled, rolled into knots or frizzed out, leading many of us to resort to buns, twists or braids before we’re ready. I personally protect my curls using one of three methods, depending what I did to my hair that day, and how I’d like it to look the next. This is the easiest method of all. Cotton pillowcases tend to cause friction with curly hair, and after a night of twisting and turning, the result can be a tangled, frizzy mess. Satin, on the other hand, is smooth, and hair glides right over it (think about how a satin nightgown feels, it’s the same for your hair), so pillowcases of this material cut the frizz factor significantly. I, however, opt for a satin scarf draped over my pillow for two reasons: 1) I haven’t gotten around to buying a satin pillowcase yet, and 2) when my hair is long it hangs over the pillow case onto the cotton sheet above. With a large satin scarf, I can situate it over the pillow AND the sheet area above, then fan my hair out from beneath my head so I’m not crushing it. When I wake up, my curls look virtually untouched. I use this method when I’ve just washed and/or dried my hair, when the curls are tighter with very little frizz, and I want them to look the same the next day. This method is perfect for sound sleepers. If you toss all night, you may end up face down in your curls (see next method)! Most curly girls are no stranger to this sleeping method. It’s simple and it really does work, though it has some drawbacks for my hair. To create a pineapple, simply flip your hair over and gather it loosely into a ponytail at the very top of your head. Do not use an elastic! Use either a fabric head band or a scarf tied loosely around the hair, so that you don’t get elastic band lines. 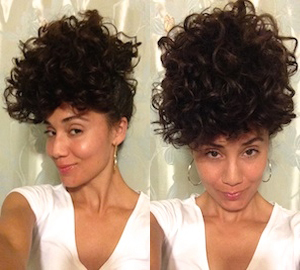 Using this method, your curls are piled together at the top of the head and won’t get crushed as you sleep. For even better results, sleep on a satin pillow case or use a scarf as I’ve described above. 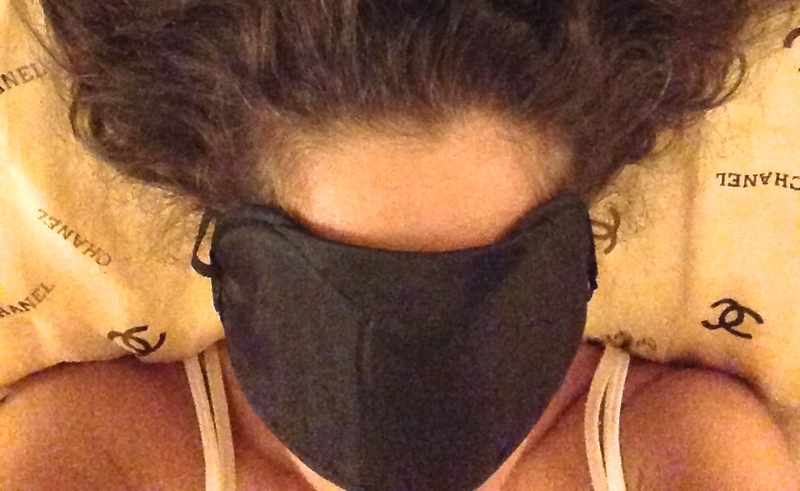 The pineapple method is better for active sleepers since the hair stands no chance of being rolled over. Many curly girls prefer this method because it stretches out their curls overnight, giving them additional length. This is actually a drawback for me, since my hair is fine and my curls stretch out too easily. For this reason, I usually pineapple on day three or four after washing, since the curls are starting to loosen up anyway. I’ll revive my hair the next morning by misting it with with water or my DIY curl refreshing spray, then I air dry or diffuse. When I’ve sucked just about all the life out of my curls as I can, and my hair is stretched and dry, I typically apply a bit of moisturizer and sleep with my hair in two simple twists. At this point my curls are definitely not coming back to life, but I haven’t had time to wash them yet, and my hair will likely end up in a topknot the next day. The twists lock in moisture and keep my hair from tangling overnight. I know different methods work for different curls, but these are the ones that work best for my frizz-prone hair. Got any tips for preserving those curls overnight? Share them below! I have definitely taken to pineapple-ing; something that I wasn’t able to do earlier because my hair wasn’t long enough. 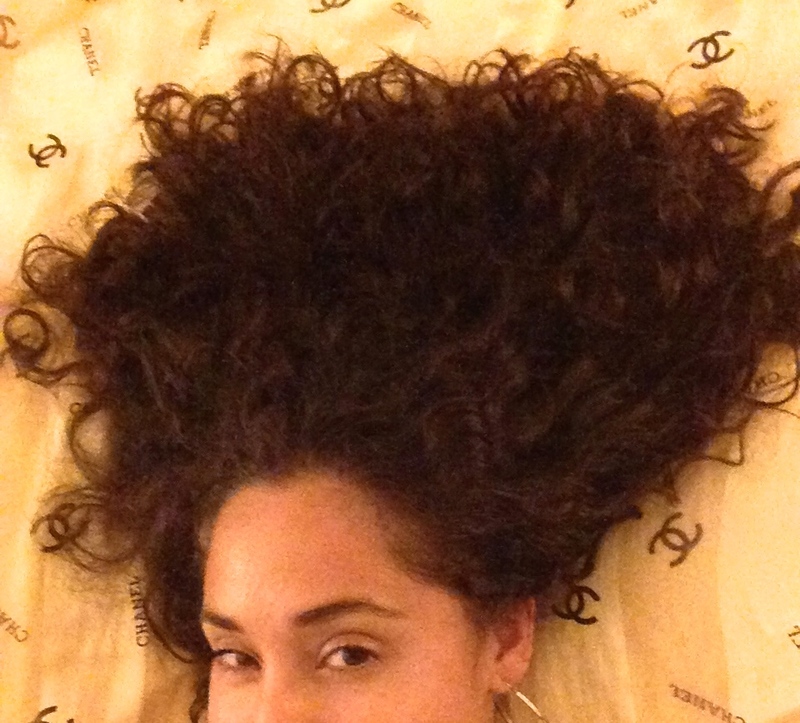 I use a satin pillowcase and pile it high, and definitely notice that my curls retain their shape much better. However, I’m totally going to steal your idea for the two strand twists with moisture overnight – what a great idea to throw it all in before you have time to wash! Love it! Thanks Jess! The twists will even give your hair a whole new wave pattern, which sometimes turns out pretty cute! Do you just do two of them, like Ri’s, or a whole head of small ones? Just two, one to each side. They’re quick to put in and easy to sleep on (for me). great tips! I totally do the first one but had never thought to try the twists for day 3 or 4…thanks for the idea! I do every single one of these..well try to, but usually stick to the pineapple as it doesn’t take up much of my time lol. I do however liked the look of my hair after its been twisted during the night!